The Dividist Papers: It's baaaaaack... 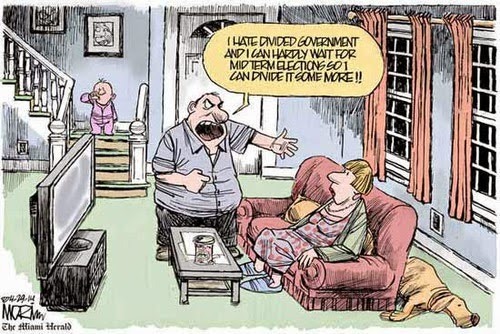 Divided Government rises from the grave. Divided Government rises from the grave. After having an electoral stake pounded through its heart last November, after being exposed to the searing media morning light of a "permanent realignment" in the "center-left" American electorate, with a silver bullet in the brain of a "broken GOP brand", and with a garlic necklace strangling it's "sixty's culture war" neck, the corpse of "Divided Government" seemed dead and buried in the media for the foreseeable future. "Inclement political weather rocked President Obama and his party this summer. Falling poll numbers and growing voter misgivings open the door for big Republican gains in next year's midterm elections. But more storm clouds gather. With Democrats controlling the White House and Congress, the GOP can now use voter distrust of unified party control (the same party in charge of the presidency and Congress) as a tool to make major gains in next year's elections--a political weapon both parties could only unsheathe irregularly over the past half century. Why are voters choosing to neuter a political party after it consolidates power? "Policy balancing" is part of the explanation, according to Fiorina. Does this mean voters say something like, "I voted for a Democrat for president, so now I'll choose a Republican to balance things out." Probably not. He believes voters engage in something a little less premeditated. "While not consciously choosing divided government, people may have a vague appreciation of the overall picture that plays some role in how they vote. People could be voting as if they are making conscious choices to divide government even if their individual decisions are well below the conscious level," Fiorina writes." Morris Fiorina is a political scientist that wrote the definitive text on Divided Government, titled appropriately enough - "Divided Government". His comment in this piece goes directly to the raison d'être for this blog. To seek an answer to the never-ending DWSUWF question - "Rather than trusting the partisan balancing choice to a subconscious impulse, would we not be much better off if a few percentage of the electorate simply voted consciously for divided government?" Every time. Without exception. "Calibrating the balance between the state and the free enterprise system is a delicate business, which is why the "big" and "small" government parties tend to take turns in power, so they can absorb and fine tune one another's achievements, and undo each other's mistakes. When the out-party wins power, it is given a mandate to tweak the controls and make a slight change in the country's direction, the key words being "slight change" and "tweak." Confronted with excess, the country enforces its own equilibrium, as when the Republican Congress crashed into Bill Clinton, frustrating both, but pleasing the country, creating welfare reform and a roaring economy. Divided government is a substitute for a conservative temperament, which is why it is frequently popular. The way things are going, it may shortly be with us again." It's the big government, stupid. "It's been a hilarious August, watching media supporters of President Obama's health care package puzzle over the obscure motivations of the noncompliant Americans rallying against it. "Racial anxiety," guessed New York Times columnist Paul Krugman. "Nihilism," theorized Time's Joe Klein. "The crazy tree blooms in every moment of liberal ascendancy," historian Rick Perlstein proclaimed in the Washington Post. While the commentariat's condescension is almost comical, the whole evil-or-stupid explanation misses the elephant in Obama's room: Americans of all stripes, it turns out, aren't very keen about the government barging into their lives." One side benefit of watching the undead specter of divided government continue to haunt the media - We're just not hearing about how the United States is really a "center-left" country any more. It may be a bit early for these proclamations and conclusions. We are still more than a year away from the midterms. But if this keeps up, DWSUWF may have to restore the Carnival of Divided Government to a monthly publication schedule. I still think it will take until 2012 to get there, but when Chris Dodd, Arlen Specter, and Harry Reid are all in trouble, we can safely say that divided government has risen from the grave. 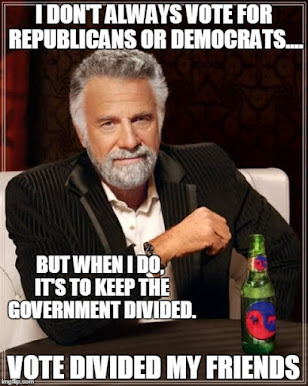 Technorati tags: libertarian , Democrat, Divided Government, Republican, Liberal, Conservative.